In October, I did a series of horror/Halloween themed movies for the binge-a-thon in honor of October 31st. Now that we are in December, however, I do not plan on doing the same with Christmas holiday movies. Simple fact is I am not a huge fan of Christmas movies. I may do a few along the way, but nowhere near the number I did in October. Still, starting off the month with a film that I had not ever seen before that blends the best of both holidays together was a no-brainer. So I watched Tim Burton’s The Nightmare Before Christmas. I had thought I had seen this before, but once it started, I realized that I had not and that I was going to be in for a treat (with no trick in sight!). Jack Skellington (Chris Sarandon of the Princess Bride fame, Danny Elfman when singing) is the Pumpkin King but he is feeling a little down. Halloween has lost its interest for him as everything always goes the same. However, Jack stumbles across Christmas Town and he is filled with the spirit of the season. Jack attempts to bring the joys of Christmas back to Halloween Town, but the results were not for which he had hoped. I did not know there was as much music in this movie as there is. The songs were very fun and enjoyable. Danny Elfman wrote and performed the music in The Nightmare Before Christmas and it is some of his best work. There is a wonderful animation style as well, with character designs that are as creative and imaginative as you can get. Some of the character designs could be scary for young children, but I found them wonderfully creepy. The stop motion animation is a work of art and must have been a labor of love for the filmmakers. Ken Page’s Oogie Boogie is a masterful villain and a perfect foil for Jack and his friends. I am not as much of a fan of Sally (Catherine O’Hara) though she has some funny moments. She felt almost tagged on. 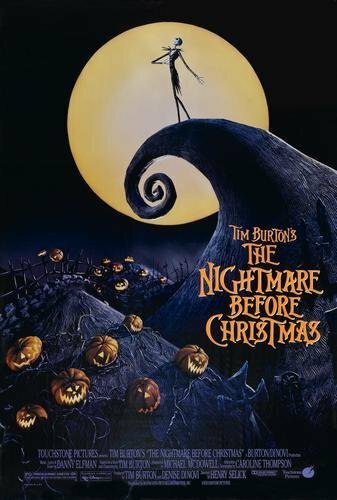 The Nightmare Before Christmas is a beautiful and dark film that shows how important both Halloween and Christmas are and I am very pleased to have seen it on HBO.